Born in 1791. Son of Kataoka Nizaemon VII and brother of Kataoka Shimamaru. He received the name of Kataoka Ainosuke I and learnt the art with his father. He became zamoto in Kyôto in the 11th lunar month of 1800, producing the drama "Shin Usuyuki Monogatari" at the Kitagawa no Shibai. He was a wakashugata actor who did not have the time to achieve fame for himself as he died the 6th day of the 6th lunar month of 1808 . Born in 1797 . He started his career as an iroko in Ôsaka during the first half of the 1800s. His first stage name was Ichikawa Mangorô . He was adopted by Kataoka Nizaemon VII and received the name of Kataoka Aizaburô I at the beginning of 1811. Then he took the name of Kataoka Ainosuke II in the 11th lunar month of 1811 in Kyôto. He took the name of Kataoka Chôdayû II in the 11th lunar month of 1816 in Ôsaka at the Naka no Shibai. He went to Edo with his master in Winter 1817 and played at the Kiriza the role of Hayase in the drama "Shinbutai Megumi no Ishizue". He went back to Kyôto with his master in Fall 1817. He took back the name of Kataoka Chôdayû (with different ideograms for the first name) at the beginning of 1818 in Kyôto and Ôsaka. Then, he took back the name of Kataoka Ainosuke II  in the 11th lunar month of 1819 in Ôsaka at the Kado no Shibai. He died the 9th day of the 8th lunar month of 1822 . Born in 1827. Disciple of Onoe Kikugorô III, his first stage name was Onoe Kikusaburô IV and he started his career in miyaji shibai in Kamigata. He became a disciple of Kataoka Gatô I at an unknown date and received the name of Kataoka Chôdayû III. He took the name of Kataoka Ainosuke III in 1836 and went to Edo in the 1st lunar month of 1850 to perform at the Nakamuraza. He went back to Ôsaka but went on tour to Edo one more time in the 5th lunar month of 1856 to perform at the Moritaza. He performed in Nagoya at the Seijuin no Shibai under the name of Kataoka Kikuo  in 1859. He died in Ôsaka the 2nd day of the 12th lunar month of 1861 . This onnagata actor was popular at the end of his career, reaching the prestigious jô-jô-kichi in Ôsaka in the 1st lunar month of 1862. There will be in the future to come a full page dedicated to Kataoka Ainosuke III in kabuki21.com. Dates of birth and death unknown. He started his career in Ôsaka at the Ebisuza, where he performed in January 1877 under the name of Nakamura Fukutarô. He performed at the Nakaza under the name of Kimura Tanosuke from May to June 1891. He became a disciple of Kataoka Gatô III and received the name of Kataoka Ainosuke in July 1891 at the Naniwaza. He switched to Okada Ainosuke in 1892 and took back the name of Kataoka Ainosuke in 1893. He took the names of Kataoka Emon and Kataoka Uemon I at the Matsushima Yachiyoza (Ôsaka) in April 1908 and May 1908. He was active in Kamigata up to March 1920. No record afterwards. Born in Ôsaka the 1st of August 1881 in the pleasure district of Shinmachi. He became disciple of Nakamura Sôjûrô, received the name of Nakamura Kakô and and made his debut in April 1884 at the Meirakuza in Horie (a district of Ôsaka). He joined Nakamura Kasen I at an unknown date. His third and fourth masters were Kataoka Nizaemon X and Kataoka Nizaemon XI. He became nadai in 1902 and was allowed to take the name of Kataoka Ainosuke IV in January 1907 at the Kadoza, playing the role of Fuwa Bansaku in the drama "Ishida no Tsubone". 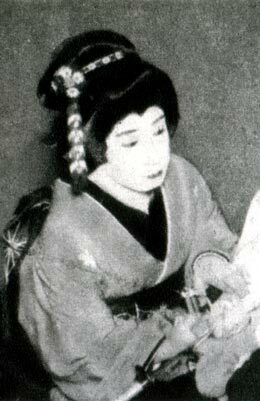 He was active as a supporting onnagata actor in the troupe led by Kataoka Nizaemon XI up to his death the 16th of May 1927. In minor theaters, he had the chance to perform important roles and it was said that his best ones were Osono ("Sakaya"), Omiwa ("Mikasayama Goten") and Osan ("Shigure no Kotatsu"). Born in Ôsaka the 10th of October 1905. He was adopted by the actor Ichikawa Shinshô, who gave him the name of Ichikawa Shinzaemon. He made his first apperance on stage in August 1909 in Ôsaka. He stopped acting when his adoptive father died. A few years later, in 1920, he became disciple of Kataoka Gadô IV and received the name of Kataoka Gakusaburô II in January 1924. 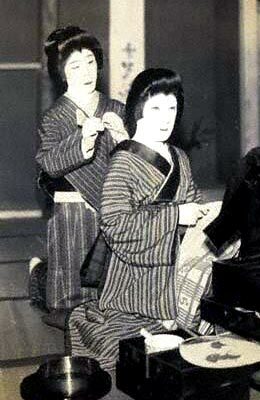 He became nadai in April 1928 and took the name of Kataoka Ainosuke V in April 1943, in Tôkyô at the Kabukiza, performing with his master Kataoka Nizaemon XII in the drama "Kirare Yosa". He was an important supporting actor for the Kataoka clan, trained as an onnagata and excelling in fukeyaku roles. He was also, at the end of his career, a regular supporting actor of Nakamura Kanzaburô XVII. He died the 26th of October 1973. The actor Kataoka Ainosuke VI is the current holder of the name since January 1992. The 6th day of the 6th lunar month of the 5th year of the Bunka era was the 29th of June 1808 in the western calendar. In Nojima Jusaburô's book "Kabuki Jinmei Jiten", it was reported that he went back to Kyôto with his master in Fall 1817 and there was no record afterwards. 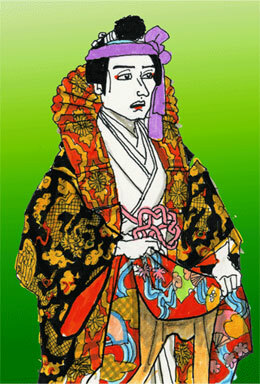 He was therefore listed as Kataoka Chôdayû III (not Kataoka Chôdayû II) in this book and as Kataoka Ainosuke II in the latest edition (2012) of "Kabuki Haiyû Meiseki Benran". Not recorded in Nojima Jusaburô's book "Kabuki Jinmei Jiten" or in the Ritsumeikan Univ. actors database. Recorded only in the latest edition (2012) of "Kabuki Haiyû Meiseki Benran". 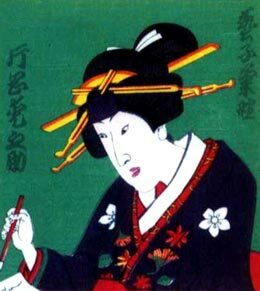 Recorded as Ichikawa Mangorô II in the latest edition (2012) of "Kabuki Haiyû Meiseki Benran". No record in this book for an actor named Ichikawa Mangorô I. The 9th day of the 8th lunar month of the 5th year of the Bunsei era was the 23rd of September 1822 in the western calendar. 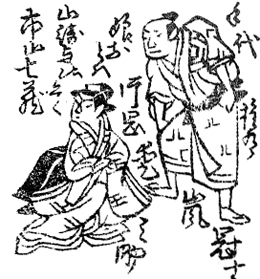 Not recorded in Nojima Jusaburô's book "Kabuki Jinmei Jiten. 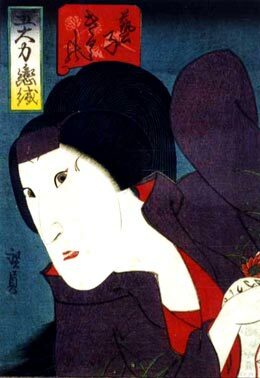 Not recorded in Nojima Jusaburô's book "Kabuki Jinmei Jiten". Recorded as Kataoka Chôdayû V in the Ritsumeikan Univ. actors database. Recorded as an unofficial holder of the name of Kataoka Chôdayû (no line number) in the latest edition (2012) of "Kabuki Haiyû Meiseki Benran". The 2nd day of the 12th lunar month of the 1st year of the Bunkyû era was the 1st of January 1862. This actor was not listed in Nojima Jusaburô's book "Kabuki Jinmei Jiten" and in the Ritsumeikan Univ. actors database. Only in the latest edition (2012) of "Kabuki Haiyû Meiseki Benran".